Recently I wrote about an ambulance accident I was in 25 years ago (The Day I Almost Died…) and the effect it had on me. Writing about it turned out to be very emotional and somewhat cathartic. So in honor of this year’s EMS Week (May 19th to the 25th) I am asking others to share EMS-related events that had a profound impact on their life. Everyone who has ever ridden on a truck, bus, rig, unit, etc for any time has memories (both happy and sad) that they will carry with them forever. Please feel free to share yours in the comment section below. I will then add them to this page (reserving some editorial license). I remember responding to a call on rt 280 a car crossed over the center striking a camero killing a young lady driver instantly. A guy was notably upset found out later it was her husband who was following her home they had just bought the camaro. A call that went in slow motion. So many thoughts, so little time. I will say the majority of my memories are of my fellow EMS personal I worked side by side with. The look in their eyes, the touch of their hand, the knowledge we were all on the same wave length as we worked to aid the ill and injured…stamp out death, dying, and disease…and stop the grim reaper. As I can still see some of the patients I cared for, remember the smells of their homes, and even feel the heat/cold of the ambient temperatures of the area we cared for them in. My most vivid memories are of the people who have dedicated their lives and time to care for people they never met. Congratulations to all of you and thank you for all you did, do, and continue doing. The car accident with Ronnie Sansone. A night with Jen I will never ever forget. My mutual aid infant code at Rutgers when I wasn’t even working, just visiting . I can still see the wispy hair on his head. Sitting down to a holiday dinner and having all three sons have to leave to take a call (more than once). The night of the South Orange Rescue Squad fire and feeling helpless watching it burn! But we were back in service the next day, Thanks to Maplewood Fist Aid Squad, And St. Barnabas loaning us ambulances to use and a local business giving us space to work out of. August 23, 1989 at 11:30 pm South Orange Police Officer John Monsees was shot in the line of duty while responding to a burglary in progress, If having a friend shot is not bad enough, his wife was on on dut with us that night. John recovered from his wounds. Responding and transporting patients brought over by boats to Liberty State Park on 9/11. 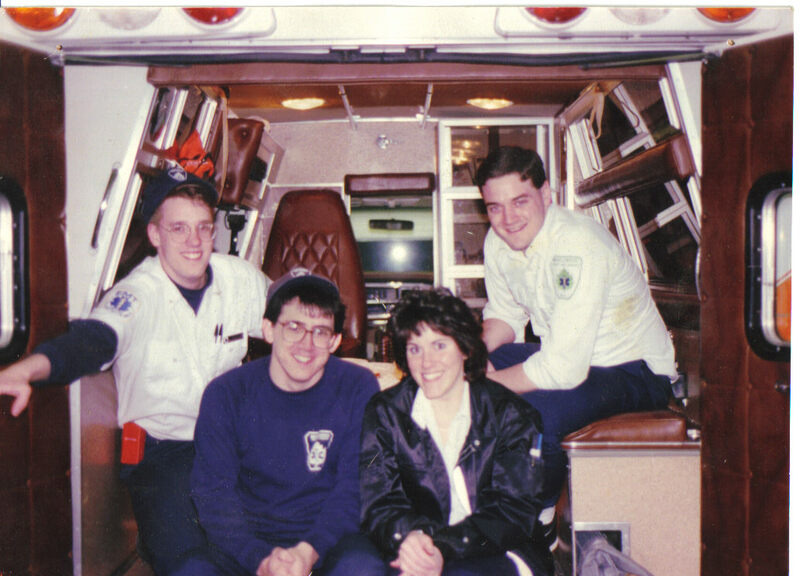 At the age of 19, I got my first EMS job in the city of Newark at UMDNJ. I had arrived. I rode around that city day in and day out on that ambulance and learned some very valuable life lessons. I was as green as they come but I learned quickly. It was on that day that I really realized that we are all human beings. No matter where we live, or how we grow up, how we dress, or behave. Everyone comes from somewhere, and each one of us is someone’s something; mother, father, sister, brother, son, daughter, or friend. We all deserve to be treated well regardless of who we are or where we live. I have carried that lesson with me throughout my life and it has served me well. The first time I did CPR was on a young, previously healthy woman in her 30s who aspirated while eating lunch and went unresponsive. I was 16, a brand new EMT. The medics pronounced on scene, but even after we stopped I couldn’t take my eyes off her sneakers – white, laced up, brand new – I can still see them today. It made me think that when she left the house that morning, and put those sneakers on, she never planned for this to happen. I never forgot his words, or that day. Ironically, a few days after that, her sister wrote a letter to our squad thanking us for trying to save her sister’s life, and the efforts we made that day. EMS is not just about making a save- it’s about touching lives and providing comfort and compassion when it’s needed most. In the scuffle of day-to-day, too often, we lose track of this.